Tiger Woods’ grasp on the PGA Tour’s all-time money list is nothing new, but a new graphic showing the history of said list is making the rounds. And it’s staggering. Before Tiger’s 2009 scandal broke, he had earned $92.86 million in 13 years as a pro. At the time, Vijay Singh was second at $60.55 and Phil was third at $55.75. Although, Woods hasn’t been the same force in the past decade, but by the end of 2018, he still held a similar lead over his two closest followers with $115.2 million in earnings compared to Mickelson ($88.07) and Singh ($69.52). Of course, this makes sense considering Woods’ 80 career PGA Tour titles is more than the combined 78 wins of those two players. Incredibly, Woods crossed the $100 million mark in September of 2012 and yet, six-and-a-half years later, no one else has come close. And there’s a chance no one else will for a long time. Mickelson passed $90 million earlier this year, but he turns 49 in June. And of the other current top 15, only Dustin Johnson, 34 and closing in on $60 million, has a real shot at it. Of course, younger stars like Rory McIlroy, Jordan Spieth, and Justin Thomas still have plenty of time to get there. But it will require exactly that. 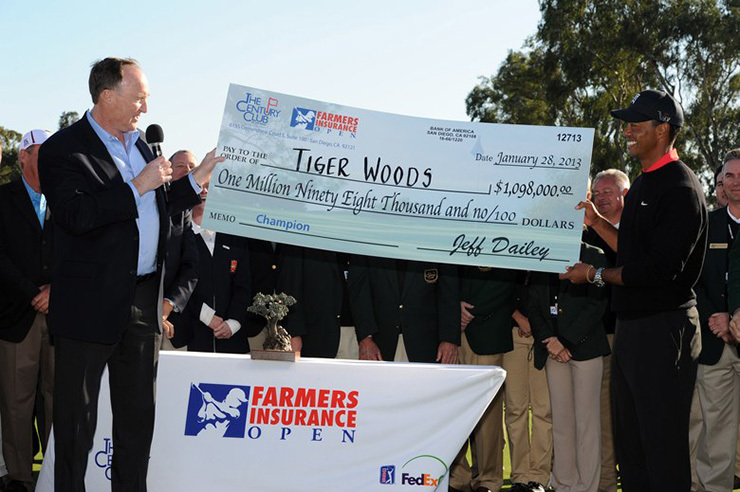 Meanwhile, Woods, who is largely responsible for the increase in PGA Tour money during this recent era, became the PGA Tour’s all-time money leader during his mythical 2000 campaign. At the remarkably young age of 24. And he hasn’t had anyone closing on him in the rearview mirror in the two decades since.